Paul Dreyfus: We're picking up some activity around Dante's Peak. Harry Dalton: This is a joke right? 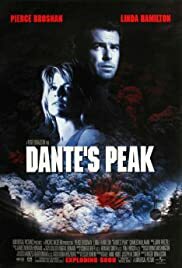 Dante's Peak? Saw this a video sale this week for a $1. Wifey was stoked as her favourite movie genre is "natural disasters". 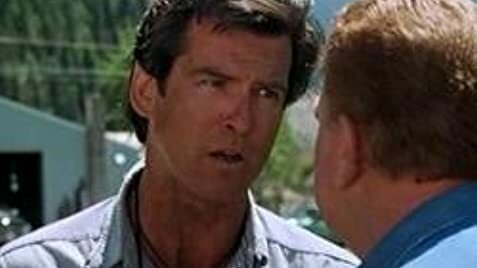 The movie revolves around volcano expert Harry (Brosnan), who decides to go and take a look at a volcano in a small US town where there seems to be some minimal activity. He is expecting this just to be a routine check, but once he starts taking some PH tests, things don't look so good. Then he finds some dead bodies in a hot spring and things look decidedly worse. He warns the town Mayor (Hamilton) the old volcano looks like she's gonna blow and she should look at evacuating the town ASAP. Just before this is about to happen, Harry's boss rocks into town, playing the time-old boss who doesn't take heed of the advice of someone smarter than him. Will the evacuation be too late? Will Harry and the Mayor get romantically involved? Will Harry again be tormented by a volcano? Will Nanna survive? Will the end be predictable? See it and find out.